A proof-of-concept USB prototype that was designed by a Russian researcher, Dark Purple, last year, to effectively destroy sensitive components of a computer when plugged in. Now, someone has actually created the Killer USB stick that destroys almost anything – such as Laptops, PCs, or televisions – it is plugged into. A Hong Kong-based technology manufacturer is selling a USB thumb drive called USB Kill 2.0 that can fry any unauthorized computer it's plugged into by introducing a power surge via the USB port. It costs $49.95. How does USB Kill 2.0 work? As the company explains, when plugged in, the USB Kill 2.0 stick rapidly charges its capacitors via the USB power supply, and then discharges – all in a matter of seconds. The USB stick discharges 200 volts DC power over the data lines of the host machine and this charge-and-discharge cycle is repeated several numbers of times in just one second, until the USB Kill stick is removed. "When tested on computers, the device isn't designed or intended to erase data," the company says. "However, depending on the hardware configuration (SSD [solid-state drive] vs. platter HDD [hard disk drive]), the drive controllers may be damaged to the point that data retrieval is impractical." "Any public facing USB port should be considered an attack vector," the company says in a news release. "In data security, these ports are often locked down to prevent exfiltration of data or infiltration of malware, but are very often unprotected against electrical attack." When And For Whom USB KILL Would Be Useful? USB Kill stick could be a boon for whistleblowers, journalists, activists, and, not to forget, cyber criminals, who want to keep their sensitive data away from law enforcement as well as cyber thieves. It is like, if you're caught, kill yourself. In the same fashion as terrorists do. Here I mean to kill the data from your laptop if the law enforcement has caught your laptop. And USB Kill stick does the same for you. However, the company claims to have developed USB Kill 2.0 stick for the sole purpose of allowing companies to test their devices against USB Power Surge attacks and to prevent data theft via "Juice Jacking" attacks. You can watch the video demonstration below by the company that shows USB Kill 2.0 stick in action. The company claims about 95% of all devices available on the market today are vulnerable to power surge attacks introduced via the USB port. However, the only devices not vulnerable to USB kill attacks are recent models of Apple's MacBook, which optically isolate the data lines on USB ports. Juice jacking is a type of cyber attack wherein malware installed on a computer can surreptitiously copy data from a smartphone, tablet or other computers using a USB charging port that doubles as a data connection, typically over USB. 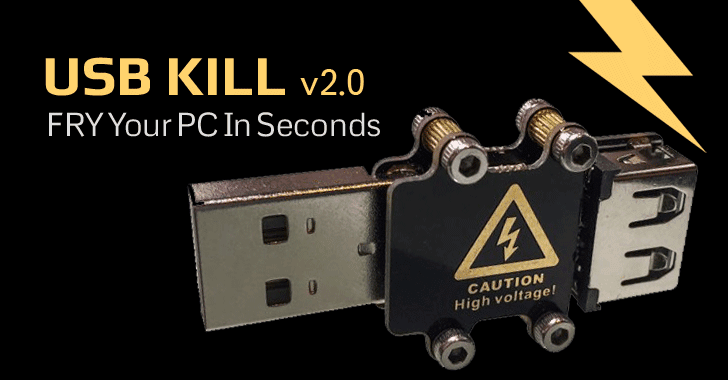 While USB Kill 2.0 has been "designed and tested to be safe," the company warns that the USB stick "is a high-voltage device" and is only meant for "responsible adults." Also, the company's website "strongly condemns the malicious use of its products." USB Kill 2.0 also comes with a USB Protection Shield, called Test Shield, sold for additional $15.70, which is designed to allow testing of the USB Killer stick without destroying the host machine.